Perranporth (Cornish: Porthperan) is a seaside resort town on the north coast of Cornwall, England, United Kingdom. It is 1 mile east of the St Agnes Heritage Coastline, and around 8 miles south-west of Newquay. Perranporth and its 3 miles (5 km) long beach face the Atlantic Ocean. It has a population of 3,066, and is the largest settlement in the civil parish of Perranzabuloe. It has an electoral ward in its own name, whose population was 4,270 in the 2011 census. 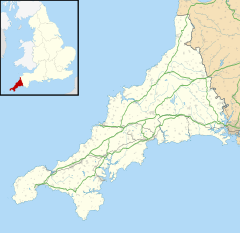 The town's modern name comes from Porth Peran, the Cornish for the cove of Saint Piran, the patron saint of Cornwall. He founded St Piran's Oratory on Penhale Sands near Perranporth in the 7th century. Buried under sand for many centuries, it was unearthed in the 19th century. The Voorspoed ran ashore in a northerly gale in Perran Bay on 7 March 1901, while travelling from Cardiff to Bahia. The wreck was one of the last to be looted. Perranporth Airfield, built during World War II as an RAF fighter station, is now a civil airfield. It is located at Cligga Head, on the plateau above the cliffs. Until the 1960s, Perranporth was served by a railway line. Built as the Truro and Newquay Railway, the line ran from Chacewater to Newquay and the principal intermediate stop was Perranporth station. Perranporth also had a second station, known as Perranporth Beach Halt. Perranporth is centred on a main street, St Piran's Road, part of the B3285 Newquay to St Agnes road. The town centre has various shops, cafés and pubs. The long-distance South West Coast Path runs past the town. There is a long-distance coach service provided by National Express (service 316) which runs between London and Perranporth. Perranporth is a popular family holiday destination. A wide sandy beach, Perran Beach, extends northeast of the town for about 3 km (nearly 2 miles) to Ligger Point. The beach faces west onto Perran Bay and the Atlantic Ocean and is a popular surfing location. There are lifeguard beach patrols from May to September and the beach is generally safe for bathing, although there are dangerous rip currents around Chapel Rock at ebb tides. Gear Sands is a sprawling holiday camp and caravan site to the north of the town centre. At the south end of the beach are cliffs with natural arches, natural stacks and tin-mining adits. There is a youth hostel above the cliffs at Droskyn Point. Nearby is the 19th century Droskyn Castle, formerly a hotel and now divided into apartments. Perran beach is backed by extensive sand dunes which reach nearly a mile inland. Known as Penhale Sands, the dunes are used for orienteering competitions, and there is an 18-hole links golf course. The far northern end of the beach is used as a naturist beach, although the MoD discouraged naturism in the sand dunes that boarded their property. The dunes are also a valuable resource for wildlife, with many rare plants and insects including Cornwall's largest colony of the silver-studded blue, a Red Data Book species. Southwest of Perranporth, the coast becomes more rocky, with cliffs rising to about 300 feet (90 metres) at Cligga Head. These cliffs form the Cligga Head SSSI (Site of Special Scientific Interest), noted for its geological and biological characteristics. The "Perranporth Shout" Sea-song and Shanty Festival is held over the third weekend in April, with performers from as far away as Scotland and Norway. It has expanded over the last nine years to be a three-day, five venue occasion. In 2016 the name was changed to 'The Loudest Shout', in recognition of the new event on the Friday night when up to 60 singers take part in a mass singing session. Perranporth used to host an inter-Celtic festival each October, Lowender Peran, drawing people in from Cornwall and the other five Celtic nations. The festival moved to nearby Newquay when the hotel that hosted it closed in 2015. The parish church, which is in the Anglo-Catholic tradition of the Church of England, is in Perranzabuloe, An Anglican chapel of ease in Perranporth dedicated to St Michael opened in 1872 and seats 100 people. The town also has its own Roman Catholic church, dedicated to Christ the King, on Wheal Leisure Road, which is part of the Diocese of Plymouth Dom Charles Norris completed stained glass windows for the church of Christ the King. The town's Masonic centre in Liskey Hill is home to 16 Masonic bodies, which makes it one of the foremost centres of Masonic activity in Cornwall. There used to be a Lodge of the Independent Order of Odd Fellows (Manchester Unity), who at one time, owned the Odd Fellows Hall near the Ponsmere Hotel, but due to declining numbers this Lodge closed and the building is now rented by Cornwall Council as the town's library. The Oddfellows building is owned by Perranzabuloe Museum, which has a display gallery and research area above the library. Surfing is popular in Perranporth with its long sands and beach break. The Perranporth Surf Life Saving Club is one of the oldest in the country and hosts an extreme triathlon event every autumn. The beach is a destination for kite surfing enthusiasts. There is a golf club, Perranporth Golf Club, just north of the town, while the football team Perranporth A.F.C. play in Division One West of the South West Peninsula League. There is a rugby club, "The Brewers" , and a tennis club. Motor engineer and designer Donald Healey, who opened the first garage/petrol station in the town in 1919; a nearby cider farm run by a grandson of his has a detailed graphic display about his life. Author Winston Graham, who lived in Perranporth for many years and whose Poldark novels are based on the area. ^ Place-names in the Standard Written Form (SWF) Archived 15 May 2013 at the Wayback Machine: List of place-names agreed by the MAGA Signage Panel Archived 15 May 2013 at the Wayback Machine. Cornish Language Partnership. ^ "Ward population 2011". Archived from the original on 11 February 2015. Retrieved 11 February 2015. ^ "Shipwreck photograph collection". 23 October 2013. Archived from the original on 28 October 2013. Retrieved 25 April 2018 – via www.telegraph.co.uk. ^ Map, The Megalithic Portal and Megalith. "St. Piran's Lost Oratory". The Megalithic Portal. Archived from the original on 29 August 2017. Retrieved 25 April 2018. ^ "Clothes free beaches". 5 August 2015. Archived from the original on 2 October 2016. Retrieved 29 September 2016. ^ "Penhale Sands Beach (Perran Sands) -". Cornwall Beach Guide. Retrieved 2018-07-31. ^ Wacher, John; John Worth; Adrian Spalding (2003). A Cornwall Butterfly Atlas. Newbury: Pisces Publications. ISBN 1-874357-23-4. ^ "Cligga Head" (PDF). Natural England. 1986. Archived (PDF) from the original on 24 October 2012. Retrieved 26 October 2011. ^ C, Dave. "Perranporth Surf Lifesaving Club". Perranporth Surf Lifesaving Club. Retrieved 2019-02-11. ^ Truro Diocesan Directory 2008. Truro: Truro Diocesan Board of Finance. 2007. p. 100. ^ "Christ the King Perranporth". Archived from the original on 1 October 2016. Retrieved 29 September 2016. ^ "Perranporth - Christ the King". Taking Stock. Patrimony Committee of the Bishops' Conference of England and Wales. Retrieved 9 July 2018. ^ "Welcome to our Folk Museum". www.perranzabuloemuseum.co.uk. Archived from the original on 17 September 2017. Retrieved 25 April 2018. 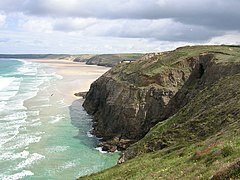 Wikimedia Commons has media related to Perranporth. This page was last edited on 17 April 2019, at 11:44 (UTC).